Welcome to Kore Kickboxing. We are an adult (14+) Kickboxing Club based near Glasgow & Stirling in Balfron, Scotland training in Korean Kickboxing. Korean Kickboxing consists of a mixture of Kickboxing, Tae-Kwon-Do, Thai-Boxing, and K1 Kickboxing. The club is run by Instructor’s Neil Buchanan (4th Dan) & Ian MacDonald (3rd Dan). We are members of WAKO (World Association of Kickboxing Organizations). WAKO is recognised provisionally by the IOC (International Olympics Committee). Class routines vary but work out is always intense. Classes include warm ups and strengthening exercises, stretching and rigorous routine’s of technique practice, padwork, and sparring. Your first lesson is free. 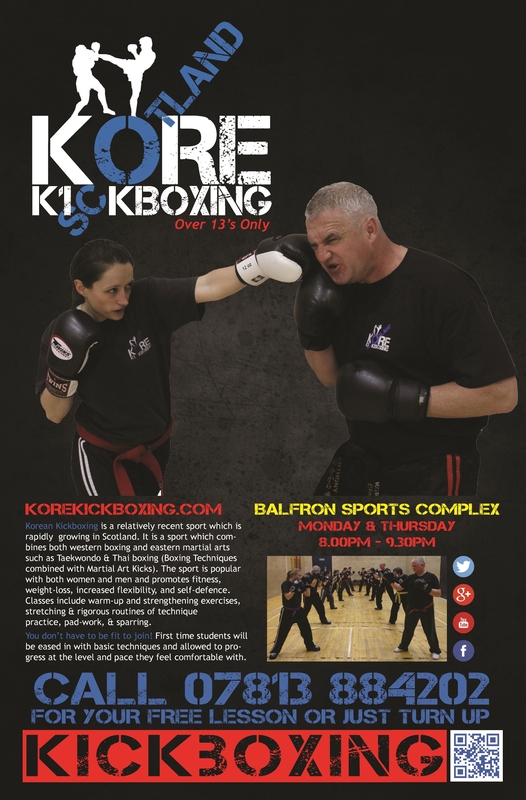 This gives you the chance to see Kore Kickboxing performed, try it out, meet people, and decide if it is for you. We like to encourage people to dive in head first, but if you would prefer to watch a class before trying us out then you are more than welcome. If you want to give it a go, please contact us.